As we get closer to Christmas, many of us go into panic mode. We need a quick gift for teacher, or a neighbor pops by with a tin of cookies and we want to reciprocate. My daughter just made a batch of hot cocoa mix to package for stocking stuffers and employee gifts, so I thought I'd share the idea. 1. In a large bowl, combine all ingredients and whisk until evenly incorporated. 2. 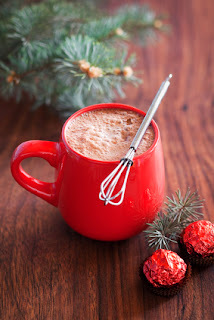 Pour hot cocoa mix into an airtight container and store in a cool, dry place. 1. Fill a mug half full with the hot cocoa mix and pour in hot water. Package the mix with mini marshmallows in an airtight container and top with a bow. Aileen Fish, author of The Bridgethorpe Brides series, writes traditional Regency romance, young adult romance and has a few contemporary romance plans for 2014. She is also an avid quilter and auto racing fan who finds there aren't enough hours in a day/week/lifetime to stay up with her "to do" list. There is always another quilt or story begging to steal away attention from the others. When she has a spare moment she enjoys spending time with her two daughters and their families, and her fairy princess granddaughter. I love hot chocolate! But I'll admit, I've never made my own. This looks easy enough. Thanks! Great idea, Aileen! I've also done this with a packet of interesting teas. Yum! I haven't had cocoa in ages but I want some right now with little marshmallows sprinkled on the top.